So I imagine I will leave the first post as my intro page. I think I like the way this can work, as I make my own mistakes, I won't hear the criticism immediately from the peanut gallery. Not that I do not appreciate the help, I surely do, but sometimes people like to jump on a mistake. I will continue to make them, and learn from them. Today 2012-3-5, I prepared some of the salvage parts for installation. Treated bumper cover with heat gun to bring back the black. It looks much better. 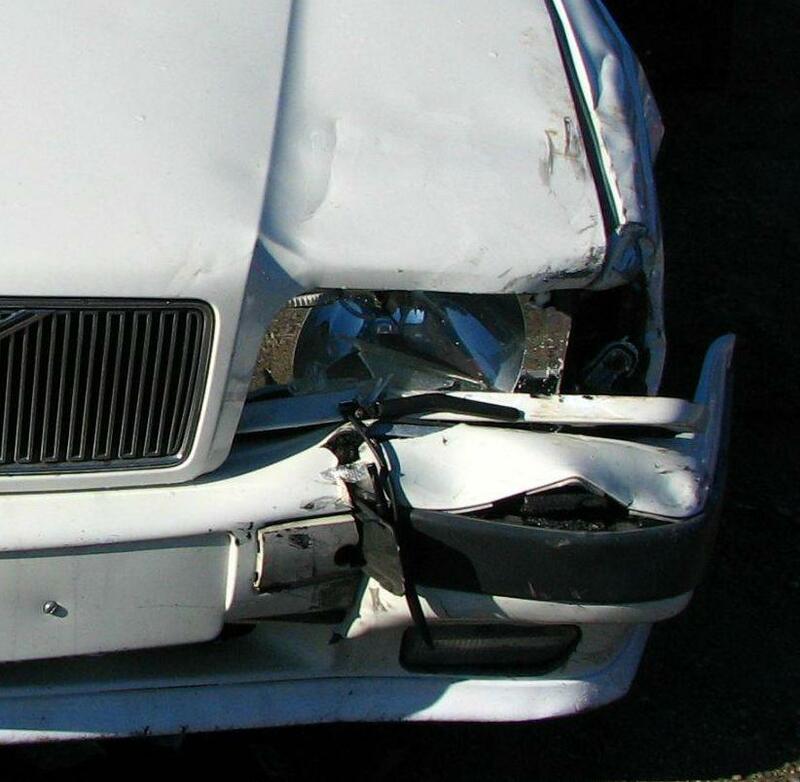 The complete bumper was $36.20. Including the reinforcement bar, the absorber, the top cover, and the spoiler/lower cover the same color as the car. 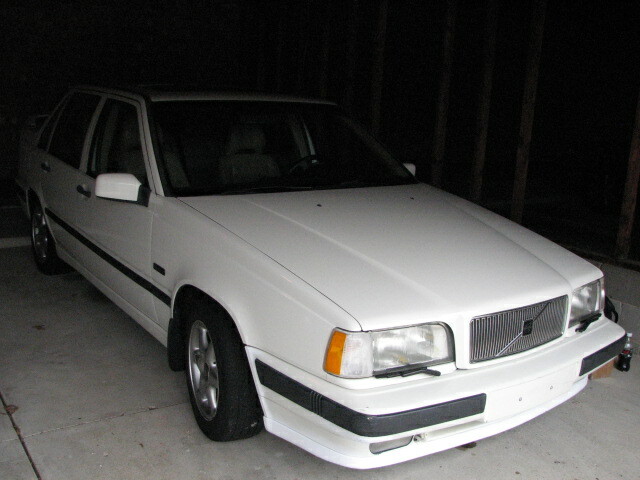 It is from a '96 850 and will give the front end of the car a new look. '96 front end '93 rear. Interesting huh? So from today forward will be the documentation of the revival after the accident. I will use the first post page for my work before the crash. I started disassembling and rough straightening of the damaged area. I am getting things visually straight at this point, and will be moving on to measured increments with precise measurements. I have the dimentions in millimeters as laid out in the Volvo spec. sheet. I am full aware of the project I am taking on, and most would not suggest even trying. I am actually enjoying the work so far. I'll see how it goes. [img][Imgur](http://i.imgur.com/uc58D)[/img] So far I've pulled the unibody frame approximately 2 1/2 inches out at the point of impact. I realize this is not a maintanance log, but an updating history of repair. If a moderator would let me know, I can move to a different catagory. Thanks for looking. I may need to crop photos. [img][IMG]http://i.imgur.com/AVY8i.jpg[/img][/img]With record high temperatures in the 80s, I've been able to make some progress. Yesterday, 2-20-12, I was able to get some of the major uunibody adjustments done, and start hanging fenders and bumper for fitment. Everything is loosely hung while I take measurements and begin the final tweaks. The '96 bumper is a nice upgraded look, although I did like the character of the original '93 front end. I will keep some of that "character" with the larger headlights and corner lights from the alter 1 body. I am actually not fond or the way they added a larger piece of filler trim between the lights and bumper for the alter 2. It does'nt look natural to me personally. So here are updated photos as of today 2-21-12. I will put together a parts list for the repairs soon. I'm pretty happy with the new look. Yesterday, 4-14-12, I did a final frame tweak and put everything back together. I put the car in the same position as the photo taken before the accident. Along with the '96 front bumper I added the larger door moldings to even out the look. I was'nt going to but I grabbed them while at the pick and pull for $10 to try them out. I was pleased. I had considered using the allter II headlights But I like this look better. Also, while appearing stock, the unique modification of the larger llights with the newer bumper is the kind of thing that only 850 guys would notice, but I like it. I had $5.00 and spare parts. It's been hot outside but 100 degree weather can't get in the way. I did the tie rod ends, control arm bushings, ball joints, and a spring seat last week. I only took pictures the first day on the first side, but the second day was much more involved, and I forgot my camera. A friend let me use his driveway the second day. The first side surprised me, in that the control arm bushings appeared to be brand new. I did not replace them but realized the noise coming from that area was the result of the control arm bolts not being torqued tight enough, and leaving room to move on the bolts. The next day, on the other side, the bushings were shot. The problem for me was, I had no reliable way of pressing out the old bushings and the new ones in. I needed that done an hour before the shop was closing and paid $35. to get it done. The spring seat I knew was shot turned out to be easier to do than I might have expected. I bought a spring compressor from Harbor Freight for $15. I did get a good workout in the arms for sure. All the other parts on the strut were reusable. These were OEM struts I had pulled from the '96 where I found many of the parts for this revival. I am expecting to do the timing belt soon, and finally the rear main seal when I can borrow my friends driveway, and engine lift. I test my neighbors patience. I know where everything is. I like this option on the '93 control arm. So after a trip to the parts yard last week, I switched out a few items that were both an upgrade, and a repair. I had planned on doing the spark plugs, but not the wires. At the parts yard, I found a '94 n/a that had plug wires that were stamped '04. I figured, that is 11 years newer than the original '93 wires that were still in my car. At .90 cents a wire, I picked up the wires, clips, coil wire and distributor cap (OEM Bosch) for $7. and some change. I told them I didn't need the cap, but they threw it in free. The old '93 wire boots were a much less efficient design for keeping things out of the spark plug tunnels. As a result of the previous neglect of the PCV system, when oil was bubbling out of the filler cap to the cam cover valley, the plug tunnels had aquired about a half inch of oil puddled in each one. After finding this in the first two plugs, I tried soaking some of the oil out of the tunnels by pushing paper towel on the end of a screwdriver. It helped, but some oil ran into the cylinders anyway. That turned out to not be a big deal. There was not any smoke noticeable when I restarted it. I used the Bosch 7955 Super Copper Plus @ $1.90 a piece. I've heard good things about them for these motors, so why not. I gapped them at a happy medium of .029. I ended up using all the scrap yard wires, and the cap as well since they were still connected to each other, and ofcourse 11 years newer than mine. I'll use new ones next time. I'll document other stuff I brought home next time. The bottom line is, The car fired up, in what seemed like the exact moment I turned the key. I could also tell the ECU was noticing the difference in efficiency. The throttle response is a world of difference, and the power increase can be felt across the band. I would have done this much sooner if I wasn't distracted with other issues. It is an immediate sense of pleasure after what was such a simple job. Gapped at .029 just because. Oil from previous owner neglected PCV system. These are the original '93 plug wires, and probably cap as well. These are not the exact ones from salvage, but similar. Yesterday, 7-22-12, I finally got to the exhaust flange leak that has been irksome since I aquired the car. It only was noticeable during acceleration and/or load. Torque twisting at the coupling. I had planned to order the parts, but on the same car i had foud the plug wires, I saw the same two bolt, spring coupling and donut gasket. The springs looked newer, so I took it apart, and the donut gasket looked very good as well. I took those home and bought two lag bolts and flange nuts at the hardware store for less than $2.00. That was all I really needed to quiet the leak. Those gaskets look pretty durable, and I'm fairly sure the original (almost 20 year old piece) was the one I replaced. The rusted bolts were the only issue, but I took care of it manually with a hand saw. My friend took too long to bring his sawzall. It is getting more pleasant to drive as the list of to-do items gets checked off. It is a different car when it is so quiet. I buy new parts wher it makes sense for safety, and reliability. But this was just too easy and cheap. It will most likely last another 15 years or so. Ha.